Nourishes and protects, brings immediate comfort and long-lasting hydratation*. Increases skin elasticity. Stimulates the skin’s own defence mechanisms and promotes cell growth and restructuring at the basal layers of the epidermis. Brings instant radiance along with a delicious scent for face and dry body skin. 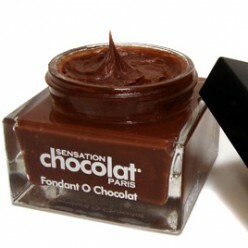 Easily absorbed cream texture, similar to a chocolate spread. Chocolate fragrance. Virgin sesame oil : a light, emollient oil obtained from sesame seeds. rich in vitamins B and E (which has antioxidant properties). )and minerals. contains some proteins and lecithin, and may help protect the skin from sunlight. 50 ml glass pot (1.76 fl.oz).